Annual Planning Calander listed by month. 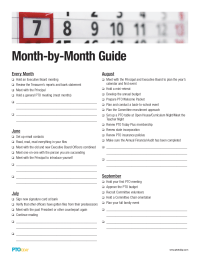 Month-by-month list of holidays and other dates relevant to parent group leaders. 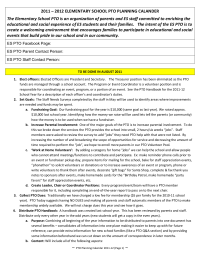 Detailed planning checklist for PTA and PTO leaders; learn more about parent group leadership and planning in the Leader's Toolkit. Downloads: 1335 Hot! Members only ? Plus members get a $25 Amazon gift card when they take a free online tour with promo code PTOPLUS19. Plus members get 20% off their first spiritwear order with promo code PTOPLUS. Plus members get a bonus bag of 10 exclusive stuffed monkeys with every order over $500.